When photographing ice hockey games, I try and get the puck in the frame. Lately, the puck has been acting like a prima donna. Always trying to hog the shot over the players. 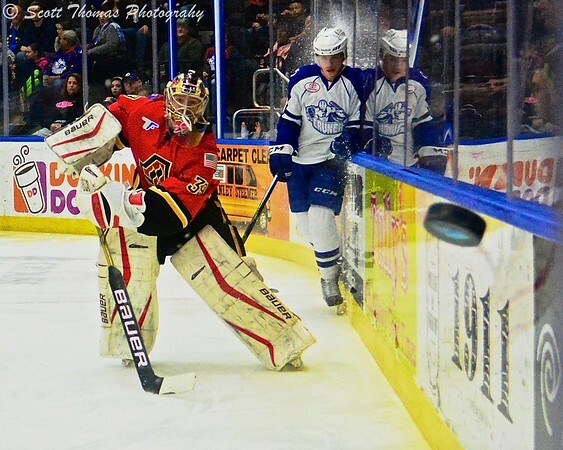 The puck flies right at the author when Adirondack Flames goalie Brad Thiessen (39) fired the puck around the boards against the Syracuse Crunch at the War Memorial Arena in Syracuse, New York on Friday, March 13, 2015. Nikon D7100/24-120VR, 1/800s, f/4, ISO 2800, EV +1.7, 24mm Focal Length. In the above photo, I am safely behind the safety glass at this end of the OnCenter War Memorial Arena ice surface. On the other end, I have a photographer hole which gives me better and sharper images and an opportunity for the puck to leave the playing surface and into me. Bridgeport Sound Tigers goalie Kevin Poulin (60) flips the puck past Syracuse Crunch Yanni Gourde (37) and towards the photographer hole at the War Memorial Arena in Syracuse, New York on Friday, March 27, 2015. Nikon D7100/24-120VR, 1/1000s, f/4, ISO 2800, EV +1.3, 24mm Focal Length. If that wasn’t enough, a few minutes later another puck was directed towards me. In both cases, the puck missed my location. 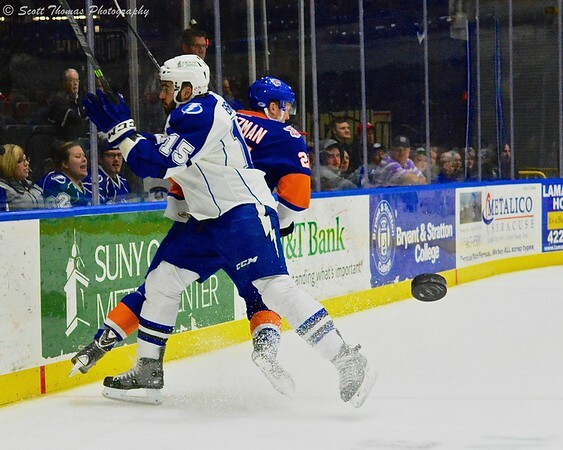 Syracuse Crunch David Broll (15) takes Bridgeport Sound Tigers Kevin Czuczman (24) into the boards as the puck again flies towards the photographer hole at the War Memorial Arena in Syracuse, New York on Friday, March 27, 2015. Nikon D7100/24-120VR, 1/1000s, f/4, ISO 4000, EV +1.3, 32mm Focal Length. I know someday the puck will hit me or my equipment which is why I always have a backup lens and camera with me at the games. 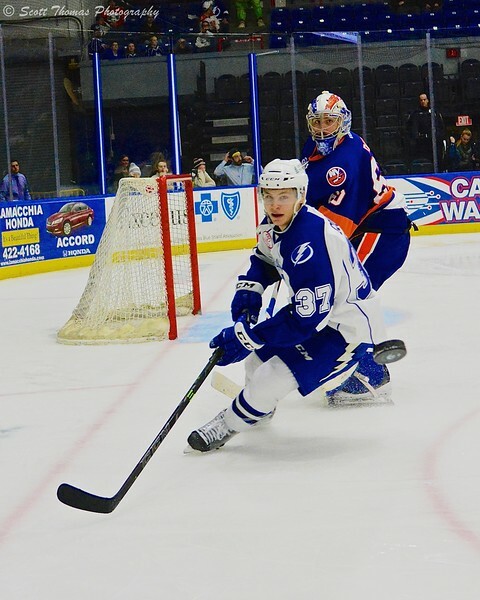 This entry was posted in Sports, Weekly View and tagged 24-120mm, adirondack flames, ahl, american hockey league, boards, bridgeport sound tigers, crunch, goalie, ice hockey, new york, nikon D7100, players, puck, syracuse, vr. Bookmark the permalink.